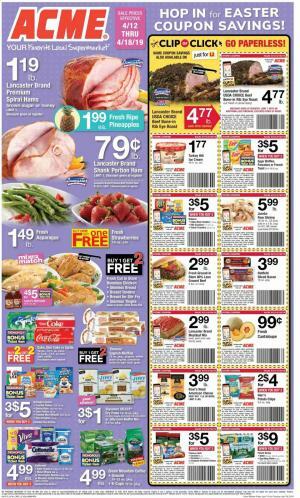 Check out the Acme Ad that offers the deals on local supermarket foods. BOGO Free, bonus products, digital coupon savings, limited-time sales, and more types of discounts are possible to find in the Acme Weekly Ads. Mix or match sale is also a part of the great discounts of all ads. Save on fresh meat products and seafood. They usually have a great selection of snack brands as well. Boost your savings with just for u digital coupons. Some services like online orders of deli trays. Acme also recommends great recipes for different cuisines’ meals including European, Italian, Latin America, and more from all over the world. Acme Markets have 177 locations in several states including Pennsylvania, New York, New Jersey, Maryland, Delaware, Connecticut. A wide range of products from the departments of the bakery, dairy, general grocery etc. 4-day sale of the Acme Weekly Ad Grocery Sale Apr 5 - 11, 2019 covers Lancaster brand USDA Choice beef t-bone steak. It will cost only $4.99/lb. Buy Land O'Lakes butter, Friendly's ice cream or Signature SELECT ice cream sandwiches, and extra large raw shrimp on the same page. There is a 10 for $10 range of grocery products on the first page. Various products from many categories are available participating in that deal. Starkist solid albacore tuna, Duncan Hines Cake or brownie mix, and more items in the 10/$10 sales! Coke, Diet Coke or Sprite will be a Buy 2 Get 1 Free deal. Digital Coupon savings is an interesting element of the ad. Buy Tide laundry detergent and Charmin bath tissue for cheaper prices with using just for u digital coupons. Open Nature® Australian Loin Lamb Chops $5.99/lb. Lancaster Brand USDA Choice Beef Bottom Round Roast $3.99/lb. Follow our Facebook page or subscribe to get emails.